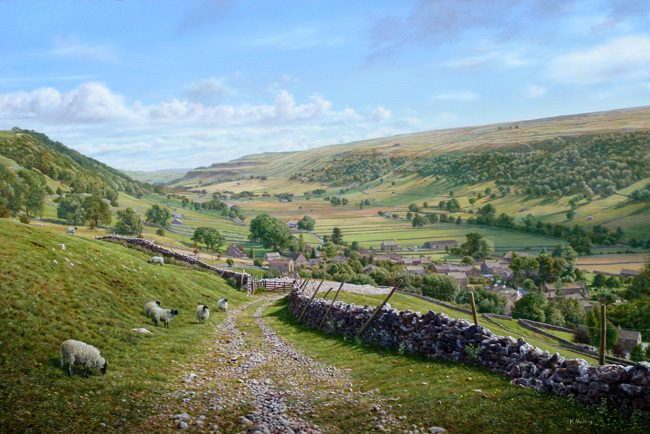 Starbotton near Austwick in the Craven area of Yorkshire where many Mittons lived for centuries. From a painting by Keith Melling. It does not appear the Mittons went more than 25-50 miles in 700 years from where they first established themselves at “Mitune” near Clitheroe at the beginning of the 12th century – not unusual for those following centuries as moving about is a modern phenomenon. So the close geographic proximity of the Norman de Mittons to the centuries later Craven area Mittons of Yorkshire is strong evidence of a similar bloodlines. As they did not move much helps substantiate Mitton ancestry with the church records. The surname did not change except for later dropping the “de” which meant “of” or from. Even though the Craven area was close to the original Norman Mitton`s manor they no longer were living there so they dropped the superfluous “de” to simplify. However, if these Craven Mittons were not of the same bloodline it is much harder to explain why such a close geographic proximity surnamed family would not be the descendent’s of the Norman de Mittons of “Mit~tun”. The French Norman surname did not change from the Norman times. By the end of the 14th century with advent of the poll tax requirement of a surname, former serfs were adapting surnames that reflected their work or profession, not the old Norman surnames after a location that they had previously been bound too. The surname de Mitton seemed to have survived that change as it had first been legally established in 1219 for the poll tax. Their are dozens of de Mittons listed in the Clitheroe Court Rolls during these centuries. It would seem that they were a rather litigious lot during those times to be in the court records so much. Their specific Craven area genealogy was not recorded until the Bishops rolls and Roger de Mitton circa 1538. Absent a specific genealogy preceding the Bishops Rolls their remains a preponderance of circumstantial evidence that the Craven surnamed de Mitton families were descendants of the early de Mittons Norman bloodline of nearby Great Mitton as first recorded by the Abbots of Whaley Abby thru 1377.The Mittons continued to reside in the Craven within the same deanery of Mytton church for centuries right down to present times. Craven Genealogy from 1577 to 1788 from Jack Knowles 1982 “Craven Mittons”. Recent research now confirms Roger as Richards father. Knowles was unsure. The Bishops rolls began circa 1538 by King Henry VIII directive that all births, baptisms, marriages and deaths were to be recorded by the local parishes and then rewritten by the Bishops of the diocese. Hence if the families remained in the parish areas their are quite reliable records back to 1538. The following British researched Knowles genealogy connected “Squire” Joesph Mitton of Horton as recorded separately by Edmund W. Mitton handwritten memo in 1906, Ridgetown, Ontario. Please see other drop down document references. The ancestry of Joesph Mitton, 1723-1792 known as “Squire”. His son Edmund we know is buried at St. Oswald’s in Horton. He can be traced back to Roger Mitton, husbandman from Austwick who died in 1585. This seems well documented. “It has always been understood that this Roger was a descendent’s of a cousin of Roger de Mitton”.– De Mitton: family foundations and origins; Daniel M. Sommerfeldt, Yank, British Columbia, Genealogical Society of Utah, 1977. Authors note. This first Roger was the brother of the two de Mitton sisters who deeded Stonyhurst in 1362 to the first John Bailey d.1372. Roger (1) Mitton of Austwick br.circa 1530-1537, d. 1585. Father of Richard. Roger married Elizabeth. Roger also married Janet Lockwood Janet Lockwood and had 2 children; Susan br.1569 and Roger br.1577-1620 Roger passed away on 1585 in Elland, Yorkshire, England. Other DOD location is Austwick which seems more likely although Elland is not far from Great Mitton. Also note that Richard below names his son Roger seemingly confirming Roger as his father. This was very common tradition to have a son named after the grandfather. Richard birth date would make Roger quite old for a father even if Richard was by a second wife Janet Lockwood. So, his birth and death dates could be questioned. More creditable is the close proximity of his birth and death to Great Mitton. Mere double digit miles gives credence to he being of the same bloodline as the Norman de Mittons. The Bishops Rolls documentation from Richard`s descendent’s de Mittons of the Craven area seems creditable. Note: Knowles authenticated research from Bishops rolls in his 1982 genealogy, “The Mittons of Craven” started with Richard born 1577.Sommerfeldt`s 1977 paper had Roger in his. Roger (2) Mitton br. 1603 d.1685 Austwick, Yorkshire. m. Margerate Halton b. 1607 d.1696. Children: Richard b. Austwick d.1706, Robert br.1629 d. 1686, Elizabeth d.unknown m. William Wood, Ann br.1653, d.unkown. unmarried. Robert (1) Mitton of Austwick br. 1629 bapt. Clapham d. 1686 Starbotton, Yorkshire (second son of above) m. Jennett b. 1629. Six children, Joseph b.Oct. 14,1661 d.1742, Roger b.1663, Richard b.1665, Elizabeth 1667, John b.1662, Robert br. 1674. Joseph (1st Joesph) Mitton br. 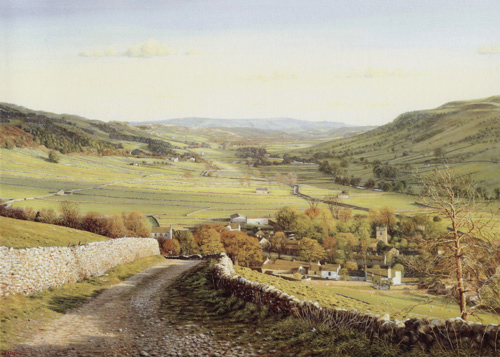 Oct. 14, 1661 d.1742 Starbotton, Yorkshire. (first son of above) m. Elizabeth br. 1661. Children Jane br. 1689, Robert (only son) br. 1695 d. 1784, Mary br. 1703 d. 1725, Margaret br. d. unknown. Robert (2) Mitton br. 1695 d. 1784 (only son of above). Starbotton. m. Elizabeth d. Dec. 3, 1738 Children; Joseph br. Oct. 13, 1723 d. 1792. 10 children, Christopher br. 1725, Mary br. 1727, Elizabeth br.1729, John br.1731 d.June 13, 1778, Jane br. 1734 d.1737, Henry br. 1736, d.1817, Jennitt br. 1738, Robert (? ), Christopher br.1740. Joseph (2) “Squire” Mitton br. Nov. 11, 1723 d. Nov. 25, 1792 Starbotton, possibly buried at Horton in Ribblesdale. Known as “Squire”. m. Mary Wilkinson br. 1725 d.1809. 8 Children of Joseph; Elizabeth br. Dec. 12, 1751 d.July 1753, Henry br. 1754 d. 1819, Mary br. 1757 d. 1810, Robert br.1759 d. 1833, Joseph br. 1765 d. Nov. 29 1814, Jane br.1765 d. 1790, James br. 1772 d. 1852 (ordained Minister). Robert Mitton br. 1759 d. 1833 Yockenthwaite, Yorkshire. died at Horton. Farmer at Lived at Kirby Lonsdale, farmer at Linggill and Thorne-in-Selside (Horton).M. Jane Blenkhorn in 1783, age 73. 11 Children. Mary bpt. Jan. 26, 1783, James, br. 1784, Joseph br. 1785 m. Ellen Stott at Hubberholme 1808, Edmund br. 1788, bpt. Horton, m. Mary Stott at Hubberholm 1809, Henry bpt. 1790, William, br. 1791 d. 1879, Elizabeth, br. 1796, Jane br. 1798, Robert br.1799, Ann br. 1802, Agnes br.1805. The above Edmund br. 1788 married Mary Stott and immigrated to Kent County, Ontario in 1818-19 with his family including their infant son John who had been baptized at St. Oswald at Horton in Ribblesdale in Aug. 1818 just before they left Horton for Canada landing first in New York before walking to Howard Twp. Kent County, Ontario Canada. He died in 1848 and is buried with his wife in Ridgetown, Ontario. John Mitton, br.1818 know as “Grover John” in Kent County Ontario. Baptized in Horton (see St. Oswald Church document). Immigrated with his parents in 1818-19 with his parents to Kent County, Ontario. See Canada Beckons for the Canadian line of Mittons from John Mitton above to today. Please note bold identify specific father to son line throughout the genealogy. Kettlewell near Starbotton in the Craven area of Yorkshire. From a painting by Keith Melling.